You walk a fine line to promote yourself. How do you share your value with the world without boasting about it? How can you exude confidence without coming off as haughty? Blowing your own horn turns people off. I know I prefer to follow brands and artists that spend little time praising themselves and provide value to my life. Who wouldn’t? If Ramit Sethi spent less time praising his own accomplishments, I would spend more money on his content. The key to building a great brand? Consistently providing great value. Without question, a brand like the one Ramit built will grow if you continue to deliver on your promise. People are thirsty for good content and will follow. However, the distance between a strong brand and a sustainable one can be measured by humility. Without too much self-deprecation, a brand must genuinely acknowledge weaknesses, listen to all parties invested and restrain bragging rights as much as possible. Celebrate success with your fans, defend your gifts to the world – and hold back the rest. I have learned through nearly a year of writing this blog that headlines, tweets and content centered around myself or plugging my writing perform far worse than direct content. I beg you, dear readers – call me out any time my writing is sullied with boasting. No one likes content adulterated by too much Craig Ormiston. In the Middle Ages, master and apprentice relationships were integral to business. Aspiring youngsters would offer continuing labour and business support to veteran craftsman in exchange for lodging, food, and formal training. Before universities popularized, trade education stemmed directly from experience in the trade itself. As classroom education expanded, apprenticeships fell to the wayside. Can someone please tell me why? The mentor and apprentice relationship is no less integral to business than it was a thousand years ago. In fact, I think the relationship may be more important today – for both sides of the table. Mentors offer seasoned experience. Apprentices offer fresh perspective. With years of service in the workplace, the mentor has war stories and lessons that can better-frame an apprentice’s education. More importantly, these stories are experienced firsthand. On-the-job training is far more vivid and dynamic than book studies because the stakes are higher. Apprentices get their hands dirty and glean a far more richer understanding of their craft in the process. Moreover, the education is reciprocal. Apprentices bring to the table a whole new way of thinking: contemporary models, innovative market approach tactics, modern brand image insights, and more. The apprentice speaks a fresh language mentors need to be versed in today to connect with the consumers of tomorrow. Mentors offer inexpensive education. Apprentices offer inexpensive labour. As a mutual service favor, very little money trades hands. A mentor can staff his or her growing business with a zealous and thirsty student without the burden of salary; an apprentice can get invaluable hands-on experience without the burden of tuition. More often than not, the education from a mentor is far more in-depth, targeted and pertinent than from a classroom teacher. You get more value for less spend. Mentors offer relevant trade skills. Apprentices offer relevant modern skills. Unlike the intimate hands-on apprenticeships of old, modern internships are often more clerical with little exposure to the higher workings of a company or trade. A true apprenticeship can bring students closer to the skills they need to grasp and aim to learn. In exchange, apprentices can introduce mentors to new methods for leveraging technology, connecting with people, and creating product. The opportunities are boundless with both new and old at the helm. Mentors offer a name brand. Apprentices offer brand vitality. Through years of service and loyalty, the apprentice will embrace the mentor’s brand. With that brand comes the mentor’s network and resource pool, saving the apprentice a lot of time and money developing his or her own from scratch. Brands are noteworthy bullets on resumes and form the connective tissue of the business world. In return for the mentor’s gracious stamp of approval, the apprentice will forever carry all the philosophies adopted and lessons learned from the mentor. The mentor’s reputation will live on through the apprentice. The only potential risks I foresee in apprenticeships are compatibility and working pace. Some people cannot see eye to eye and lack patience for one another. Compatibility can be offset by both formal and casual interviews, along with recommendations and referrals. 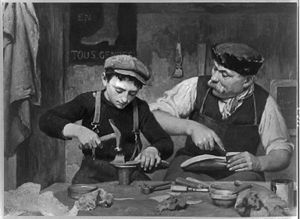 And unlike the Middle Ages, I do not think it wise to start apprenticeships too early in career development; an apprentice needs strong theoretical introduction to a trade first before asking a mentor for valuable time. If you are a seasoned professional, I highly encourage you to take on an apprentice. If you are a student, develop relationships with professionals in your field of interest and ask permission to shadow them. Listen well to each other. After a while, you will both learn a lot. I guarantee it.